156443 is pictured alongside a Bachmann 158. Liveries produced- Provincial 156443, 454, 470, 480, 481 and 465 (last with Scotrail logos). Regional Railways 156402 and 420 (last with Green stripe). Central Trains 156407. Strathclyde PTE 156433. Strathclyde 156501, 502, 512 and 513. Scotrail 156447. Northern Spirit 156490. Notes- 156470 is a single car while all others are two car sets. Hornby plans to re introduce three Class 156 models, these are Central Trains 156401, Strathclyde PTE 156430 and Northern Rail 156425. Also see Hornby Class 155 and Bachmann Class 150/1/2 which is due this year. Available from- This model is out of production but is often sold on Ebay and should be available from some outlets with remaining stock and other such outlets. The Lima Class 156 is truly an excellent model. By modern standards it could do with improvements however. Detail to the underframes is minimal and the exhausts by the joining ends of the cars are left black. End detail is very good with lights fitted at glass or plastic in small drilled holes to give an effect far better than the painted on types seen on Hornby Class 142 Pacers. One car is poered with the motor visible indie but not too much. The windows are nice and flush too and the roof grooved like the real thing. In trials the model runs very well and makes a very realistic engine sound which may or may not have been intended. It takes to most speeds well and slow speed control is good. A better motor than the old type ringfield would make the model more reliable. Destination boards are stickers which are one of the few bad points on these models. Mine was bought from Ebay and so they were already stuck on. Replacements should be easy to make if you wished. Gradient climbing has not been tested but the model has little in way of heavy weight or weight difference between the cars and so should run up and down slopes well. The model could do with a few things to make it pertfect for your chosen period or location. A detailing kit is available from Hurst Models which replaces the underframes with more detailed ones and adds other details such as debris collectors. Snowploughs are also available which are fitted to Scottish Class 156 units. Lights would improve the mdel greatly and Expressmodels produce kits for both DDC and DC including an advance day and night digital set. 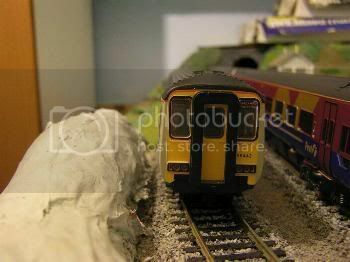 The Hurst Models kit as it looks applied to a Class 156 without paint applied to it. Overall the Class 156 is a must for modern image and even though it is out of production it looks like Hornby will revive this amazing DMU. Good points- Reliable, variety of Liveries, Variety of upgrades. Bad points- Poor underframe detail, dated motor. Great review mate, i am tempted to buy one now orr maybe wait for the newer version to come out. Good stuff - I particularly like the idea of saying where extra bits and pieces can be obtained... This site should create a database of all the trains with these details and reviews. Would be very popular - and useful! Might take a while to review all of em lol ! It might also help the manufacturers see where they went wrong with various things... and where they 'did good'.